It’s been a few days since I blogged, and that is mostly because I’ve been both insanely busy and absolutely shattered. Luckily, Laser has allowed me to steal her usual blogging day so that we can all thank our wonderful Secret Paws gifter for an absolutely amazing Christmas gift box. Laser, McLaren and I were lucky enough to be the recipient of a gift from Iain, Marc and the cats of Katzenworld. They sent us a wonderful box of goodies from 4cats. I think the best thing to do is to hand over to Laser and McLaren and let them tell you what they think of the gifts. I was overwhelmed by the generosity and the cats didn’t know where to look first. Santa Paws really was great to us and I must send the lovely folk at Katzenworld a million thank yous and dankes. Laser: Carry this box says “4cats” on it. Quick, open it because it’s for me. And McLaren, but I’m sure it’s mostly for me. Laser: This says ‘Katzenworld’. 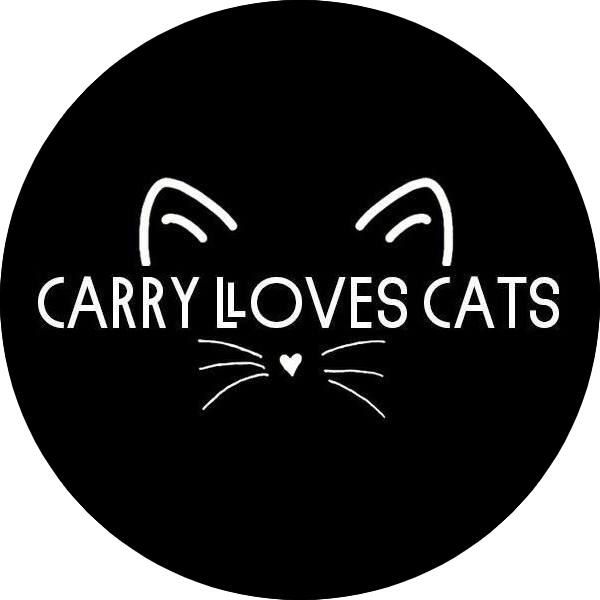 Ooh Carry it’s from out blog furriends. McLaren: I can smells something good. Let me get my head rights in here to sniffle more. McLaren: That’s better we can see everything now. What is it all Mummy? Will you help us open it? There’s lot of things. We’s must be the lucky cats who haves been good all year. Laser: Carry look I fits in the box too. This is the best present we ever have been given! McLaren: Mummy this food smells good, quick quick let us taste it. Laser: McLaren, I think that it says that they are reindeer balls. I’m not sure about the sound of that. It might be like that Get Me Out of Here show Carry watches. McLaren: Mummy what are these? They smells good but my pawsies can’t open the bag. Carry: It’s more food. Shall we try them at dinner time? McLaren: Yes please, how long away is dinner time? Carry: How cute is this little keyring! It’s adorable. And this cat tree toy holder is brilliant! I’ll have to put it up right away. Carry: Purrfect, now I don’t have to have your string toys tucked in the back of the toy box and you can play with them yourselves! Laser: Carry can you open the packets please, because these smell so good and we really really want to sniff it properly. McLaren: Ommnomnom dhes nis is goob. om nom. Laser: I don’t know what this is but I LOVE IT. Carry: It’s a bite like cat nip, only called valerian. Laser: I don’t know what that is but I LOVE IT. Laser: Oh gosh Carry I can smell catnip and valerian in these packets too. Quick quick quick I neeeeed it Carry. Laser: Oh yeessssss. I’m going to rub it all over me. This is the best day ever. Yesssss. As you can see, the gifts were a complete hit with the cats. They’ve been loving the valerian toys, having never had any before. I’ll leave them on the floor when I go to work and I’ll come home to find them on the sofa with one of the cats looking nice and comfy. I honestly can’t thank Iain, Marc and the cats enough for their gifts. Laser, McLaren and I are eternally grateful and I’m sure they think about you and your generosity every moment between their valerian highs. Thank you once again and thanks to everyone at Secret Paws who worked hard to bring the exchange together this year. Merry Christmas everyone – now we have the excitement of waiting until our giftee posts their gift. We’re super excited and hope that they like it. Wow, that is one box full of wonderful gifts. Love the pictures of everyone. Christmas came early at your house. Have a fun day. The gifts are incredible – McLaren and Laser were extra good kitties this year! Where can I get some of those long pillow things, they look perfect for cats to play with. Oh my, what a haul of awesome gifts. You even got them before Christmas. You guys are so lucky. WOW – what a box full of wonderful STUFF you all got from Katzenworld. So many things to play with, sniff, eat and a nice “sitting in” box too! Merry Christmas to all of you from me and my Mom. it really is awesome. we were very lucky! Wonderful stuff in your goodie box! I especially like the cat toy holder; we put away all string/stick toys in a drawer. I don’t really have any drawers other than for clothing, so it all goes into a wee box normally!